Emily Klein doesn’t know she has killed her husband until the day of his funeral. At first, signs point to a tragic accident. Yet, as Emily pieces together the events before his death – events which led to her own memory loss – she begins to suspect that her husband’s death may have been the result of more than a terrible twist of fate… But the accident is only the beginning. Because while Emily’s physical scars will heal, the trauma of the accident has awakened old ghosts. She hears strange sounds, catches things that can’t possibly be there in the corner of her eye. Before long, everywhere she looks, she seems to see her husband. And suddenly, Emily finds herself asking the most dangerous question of all. Can she really trust herself? Emily Klein doesn't know what her husband is dead, until the day of his funeral when she wakes in hospital with no knowledge of what happened, or that she killed him. Her memory has gone, and she is struggling to cope when she can't even remember the accident that changed her life once more. However with the support of her nearest and dearest you would think that all would be plain sailing. No. Strange things begin to happen, It doesnt seem that her husband is really dead, not when he is texting her - Emily begins to doubt her brain even more. 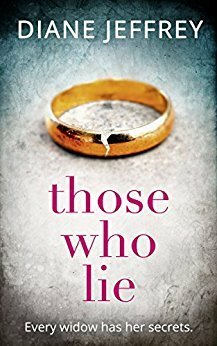 Those who lie is a gripping thriller that isn't obvious, to me - its compleling, it had me doubting myself so i can only imagine what Emily was going through. As a reader you become very unclear on who you can trust and you cannot, becasue not everyone is as they seem. With a cast of characters that are well padded out and so much to learn about them all, in some parts the pace has to slow. However I didnt expect this to be as gripping as it was, i had heard good things but it didnt prepare me for the twists and turns it would entail. With a brief synopsis and not alot to go on - it makes the reader want to delve in even more. The tension builds at a steady pace, with the grand reveal at the end that still left me shocked. A fantastic debut read from an author that i cannot wait to read more from. I love this type of thriller Em, when you don't know who or what to trust.